It’s a great investment when you choose green energy. You’re improving the health of your own family, making the world a better place, and assisting in creating jobs for those looking for work in the industry. In part one of, West Coast Solar discussed: public health, global warming, and energy reliability as it relates to renewable energy sources. 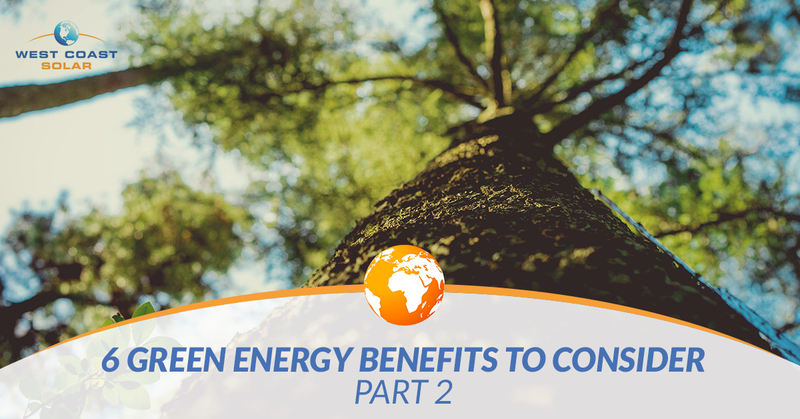 If you want to learn three more benefits to finish off the post series, you can read on to find out. A big concern is the economic impact of renewable energy. What will happen to the jobs created by fossil fuel discovery, extraction, refinement, and distribution? Green energy is a labor intensive compared to the fossil fuel mechanized and capital heavy process. So transitioning workers from one industry to the other is simply a matter of training. Solar panels need to be installed by humans. Wind turbines need to be maintained by certified technicians. Hydroelectric plants need to be supervised by experts. These are all positions the fossil fuel industry workers could fill as green energy supports the global energy needs. In 2016 the solar industry employed over 250,000 people in sales, manufacturing, installation, and more across the entire U.S., which was a 15% increase from 2015. Green energy is currently providing affordable energy prices all over the country. This affordable, consistent pricing can help stabilize the energy market altogether. Fossil fuel energy prices are prone to massive shifts, pending other economic influences. Renewable energy is reducing in price for investment and installation while providing energy at a lower price, which makes it the obvious choice for the future, whether it be your home, the entire country, or the planet. A great technological foresight of renewable energy, solar and wind, is that they’re modular in function. This means mass-scale failures are either non-existent or less likely to occur. Fossil fuels typically are built as distribution systems, which means a single energy source is spread out over a large geographical area. Whether a natural disaster or a human incident, the distribution of the energy can be partially or entirely cut off from the recipients. With modular energy systems, damage during a natural disaster is mitigated and easily resolved, since the power source or energy stored is in multiple locations instead of one central location. For example, two houses in the same neighborhood, one “on the grid” and one “off the grid” will experience a city-wide power outage differently. The “on the grid” home will have to wait until the power company resolves the outage issue. The “off the grid” home will be able to use stored energy in their home batteries, gather new energy, whether solar, wind, or water, and continue living life. West Coast Solar Supports You! Whether you’re choosing green energy to support your family, the economy, or the planet, call West Coast Solar today. With 10+ years of solar panel system design, installation, and maintenance, they serve the Northern California area with confidence. West Coast Solar believes in keeping solar simple and the customers satisfied. Call today to start your green energy solar system design today!